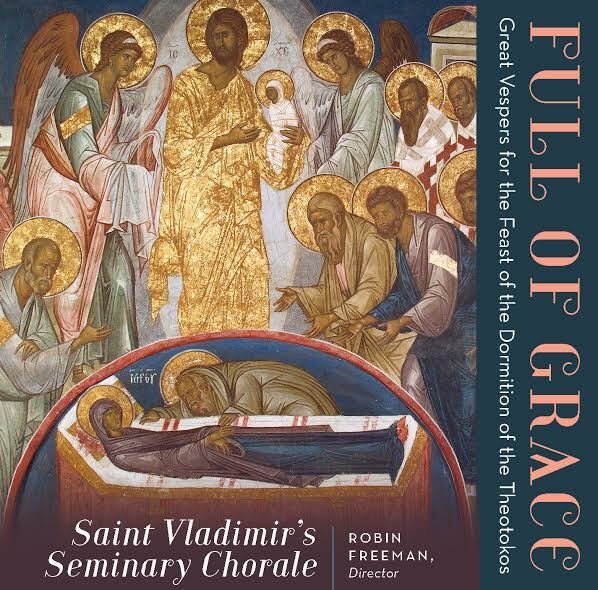 Saint Vladimir’s Seminary Press here recently released a music CD containing all of the hymns for Vespers for the Great Feast of the Dormition of the Mother of God, arranged for variety of choir sizes and levels of competence. Titled “Full of Grace,” the CD was recorded as a liturgical service and aims to help Orthodox Christian choirs from various backgrounds render the liturgical service beautifully, in accordance with their make-up and musical abilities. Many of the hymns for the CD were rearranged by Dr. Nicholas Reeves, Assistant Professor of Liturgical Music at the seminary. The priest’s part in the service is chanted by Archpriest Dr. Alexander Rentel, the John and Paraskeva Skvir Lecturer in Practical Theology at Saint Vladimir’s, and the deacon’s part is chanted by Deacon Gregory Hatrak, who also is Marketing and Operations Manager for SVS Press and Bookstore. “The psalms and hymns newly arranged for this recording respond to an indigenous necessity for monophonic chants, possessing value on their own without accompanying parts,” said Dr. Reeves, “that is, chants withisons, as well as standard four-part harmonies. “Understanding the hierarchy of polyphonic function, something long established in Orthodox cultures, can allow the interpreters of these hymns to render them in multiple ways as is best suited for their particular context,” he explained. The CD may be ordered at www.svspress.com/full-of-grace-great-vespers-for-the-feast-of-the-dormition-of-the-theotokos/.